The conventional education paradigm consists of a craftsman-like delivery model. This model suffers from variable quality, system level inefficiency, high costs, and lack of scalability. Online and blended solutions can significantly address these issues, but at the expense of significant R&D-like development expenses. Currently, these costs are being borne by individual institutions. 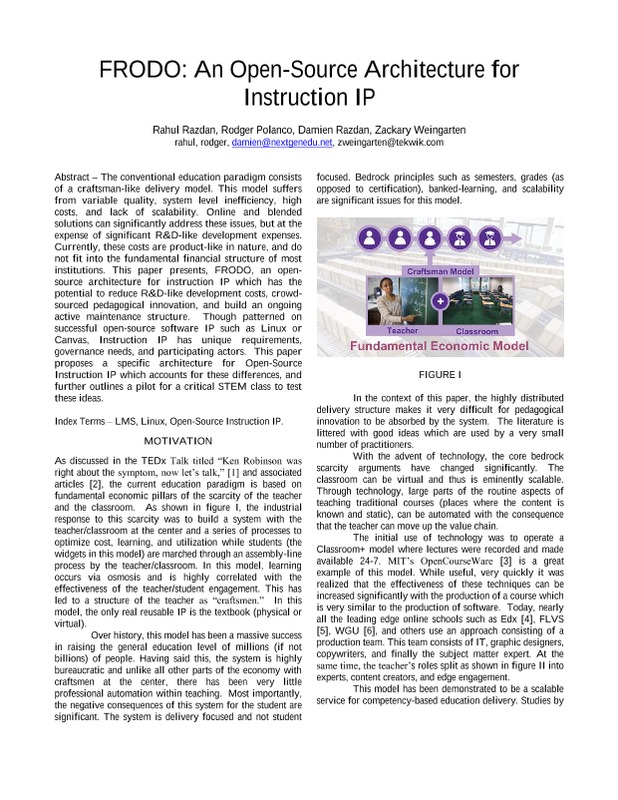 This paper presents an open-source architecture for instruction IP which has the potential to reduce R&D-like development costs, crowd-sourced pedagogical innovation, and build an ongoing active maintenance structure. Though patterned on successful open-source IP such as Linux or Canvas, Instruction IP has unique requirements, governance needs, and participating actors. This paper proposes a specific architecture for Open-Source Instruction IP.